Heat oven to 350°F. Spray 8x4-inch loaf pan with cooking spray. Cook and drain pasta as directed on package. Meanwhile, in 10-inch skillet, melt 2 tablespoons of the butter over medium heat. Add carrot; cook and stir 3 minutes. Add zucchini; cook and stir 2 to 3 minutes or until just tender. Add garlic; cook and stir 30 seconds. Add flour, salt, pepper, nutmeg and pepper flakes; cook and stir 1 minute. Gradually stir in milk. Heat to boiling, stirring constantly. Boil and stir 1 minute. Add spinach; stir until wilted. Remove from heat; stir in cheeses until melted. Stir in pasta; pour mixture into pan. Bake 20 to 25 minutes or until bubbly around edges and heated through. Let stand 10 minutes. Meanwhile, in 3-inch skillet, melt remaining 1 tablespoon butter over medium-high heat. Add bread crumbs; cook 3 to 4 minutes, stirring frequently, until golden brown. 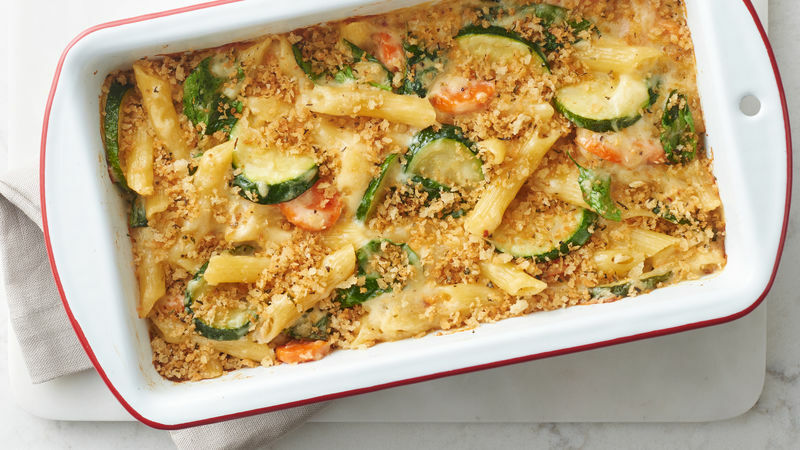 Sprinkle over baked pasta. This hearty pasta dish makes a satisfying main dish but could also be served as a side to a simple roast. Try serving with a crisp, dry white wine and crusty bread.